Hammock Park is a multifamily home development of Atlanta, Georgia-based builder Ashton Woods. It is a small community of townhouses tucked on the cozy northwestern corner of 10th Street and Simmons Avenue. Its site is only some 800 meters north of the stretch of Fruitville Road between Honore Avenue and McIntosh Road, traditionally a fertile hunting ground for ideally located Sarasota homes for sale. The Hammock Park townhouses nestle amidst verdant native vegetation, lush stands of trees and wetland preserves that largely dominate this side of Sarasota. The greens and fairways of the public Bobby Jones Club directly adjacent west of this neighborhood add to the community’s refreshing backdrop. Towards the townhouses’ eastern and southern perimeter spread the charming single family homes of Pinewood Forest and the quaint villas of Village Oaks, likewise all tucked amongst mature landscaping and tree-canopied streets. 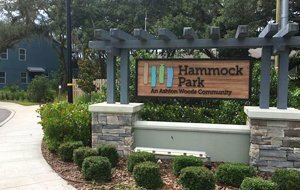 Ashton Woods launched Hammock Park in the Sarasota real estate market in November 2016, offering three flexible floor plans. These residences have living spaces of between 2,100 and 2,700 square feet with starting prices in the high $200s. Through consultants at The Studio by Ashton Woods, buyers can personalize the interior design and color schemes of their chosen floor plans. Each Hammock Park townhouse is designed with three bedrooms and choices on either two-and-one-half or three-and one-half baths, and a two-car garage. Interior features include designer cabinetry, granite counter tops, ample pantry space, and walk-in showers in the master bath. 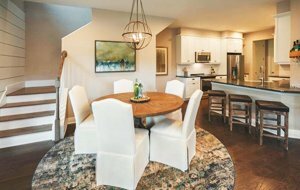 One of Ashton Woods’ floor plans in this neighborhood is the 2,272-square-foot Prescott design with three bedrooms, two baths and a half-bath. Its ground floor features an open floor plan with family room, dining room and island kitchen, plus a master suite. The second floor houses all of the unit’s bedrooms, and a covered balcony is also on this townhome’s second level. Another choice at Hammock Park, the 2,139-square-foot Fairfax design, notably came out with the Best Overall award for multifamily homes in the 2017 Manatee Sarasota Parade of Homes. It romped off with this citation for multifamily residences having more than four units, after winning the judges nod on floor plan, curb appeal, architectural detail, kitchen, and master suite. Hammock Park homes for sale likewise include the Hawthorne design with a floor area of 2,436 square feet. It has three-bedroom layout as well, along with two baths and a half-bath. Its spacious configuration provides residents with a family room, dining area and island kitchen. It has a master suite on the first floor, while a bonus room and covered balcony are upstairs. As delightful for prospective buyers, this design’s interiors feature hardwood floors, granite countertops and 42-inch designer kitchen cabinetry. As enchanting to would-be buyers of Sarasota homes for sale, Hammock Park is convenient to downtown Sarasota and Interstate 75, respectively west and east of this Ashton Woods development. Also nearby are several popular leisure facilities and commercial hubs like the Sarasota Commons which is host to a Publix and Bealls Department store. Besides the public Bobby Jones golf links, other nearby area attractions include the 17th Street Paw Park, the grounds of Miss Sarasota Softball, and Fruitville Park on Richardson Road. Below are the current real estate listings available at Hammock Park.